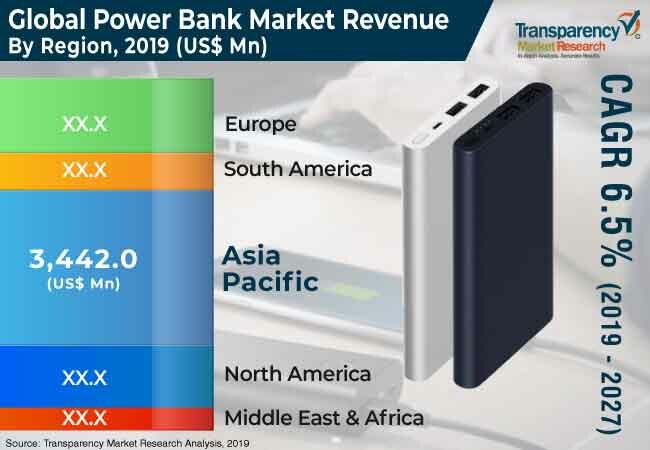 According to a new market report published by Transparency Market Research titled “Power Bank Market – Global Industry Analysis, Size, Share, Growth, Trends, and Forecast, 2019 - 2027,” the global power bank market is expected to reach a value of US$ 15,994.6 Mn by 2027. The market is estimated to expand at a CAGR of 6.5% during the forecast period from 2019 to 2027. Based on volume in units, the market stood at around 376.7 million units in 2018. In terms of region, Asia Pacific acquired greater share in the power bank market in 2018. Asia Pacific is one of the biggest manufacturing hubs of electronic devices such as Bluetooth speakers, smartphones, iPads, etc. Manufacturers such as Mi-Corporation manufacture several devices such as smartphones and wireless earphones along with the power banks. Presence of such players in the region who provide cost effective products help consumers to demand power banks. India and China are the two prominent countries in the region with huge population. Growth in smartphones has fueled the growth in demand for power banks. Rise in demand for easy and convenient charging options has helped global manufacturers to innovate with the product and to make lightweight and high charging capacity power banks. The development of smart devices has helped in driving demand for power banks. Innovations by manufacturers have also led to increased demand for the product. However, smartphones having high capacity batteries and efficient chipset in the device is the restraint which can affect the demand for power banks. Based on product type, portable power banks dominated the market in 2018 and were valued at US$ 4,152.4 Mn at a CAGR of 6.4%. The dominance of this segment was due to easy to carry power source coupled with wide availability. In terms of power rating, the 5,000 mAh – 12,000 mAh segment dominated the market in 2018 due to more consumer acceptance at an affordable price. Based on battery type, lithium ion battery dominated the market in 2018 due to its durability and easy availability. By port type, power banks having type C charging port has the highest market share due to wide popularity of Type C charger among manufacturers as well as consumers. Based on application, the smartphone segment dominated the market due to growing demand for smartphones worldwide. Electric source of charging dominated the market in 2018 due to the more convenient option for charging power banks and easy accessibility to electricity as compared to other segments. By distribution channel, the offline segment dominated the market due to preference of customers to check and compare the products physically. By region, the market in Asia Pacific is forecasted to expand at a high growth rate due to focus on more cost effective solutions. Consumers in China, India, and Thailand prefer buying low cost power banks. Prominent players in the power bankmarket include GP Batteries International Ltd, EasyAcc.com, Inc., Maxell Holdings, Ltd., Anker Technology Co. Limited, Braven LC – INCIPIO Technologies, Inc., IEC Technology, LLC, Apacer Technologies, Inc., Panasonic Corporation, Mophie, Inc, RavPower, MiPow Limited, Samsung Electronics Co., Ltd., Goal Zero Corporation, Sony Corporation, and Xtorm. The power bank market is segmented as below.